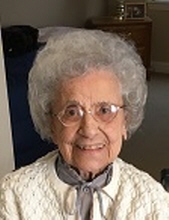 NELSON, Helen R. ( Majda) - Age 96, of Grand Blanc, died Wednesday October 17, 2018. A memorial service will be held at Holy Redeemer Catholic Church, Burton with burial to follow at Great Lakes National Cemetery at a later date. Arrangements provided by Sharp Funeral Home and Cremation Center, 6063 Fenton Road, Flint. In lieu of flowers those desiring may make contributions to Holy Redeemer Catholic Church. Helen was born January 28, 1922 in Flint, the daughter of the late George and Rose (Sadzuga) Majda. Mrs. Nelson married her beloved Ted Nelson in Flint on May 6, 1944. She was a graduate of Northern High School and also continued her education with 2 years of college at Baker College. Mrs. Nelson was a life long resident of Flint and Grand Blanc. Helen retired as a senior accountant for General Motors Buick Division in 1980 with 30 years of service. Surviving are: husband of 74.5 years, Theodore "Ted" Nelson of Grand Blanc; daughter, Rosemery (David) Nelson Gray of Greensboro, NC and son T.J. (Maxine) Nelson II of Houston TX; grandsons, Ted (Beth) Nelson III of Dallas TX, Jason M. (Sheri) Nelson of San Antonio, TX; Benjamin Gray of Greensboro, NC and Brendt Gray of Greensboro, NC and two great grandsons, Michael T. and Matthew J. Nelson. She was also survived by her nieces, Gerri McKeown and Mary Roslyn Key; nephews, George and Christopher Marzonie and Jack Slagor. She was also preceded in death by her sister Frances Marzonie; and brother Tony Majda. Tributes may be shared on the obituaries page of www.sharpfuneralhomes.com. To send flowers or a remembrance gift to the family of Helen Rose (Majda) Nelson, please visit our Tribute Store. "Email Address" would like to share the life celebration of Helen Rose (Majda) Nelson. Click on the "link" to go to share a favorite memory or leave a condolence message for the family.